Image courtesy of Stevenson University. NJInsideScene.com is proud to present news we have received about students from our area, that we have learned are achieving great things at the higher institutions of learning where they are attending. 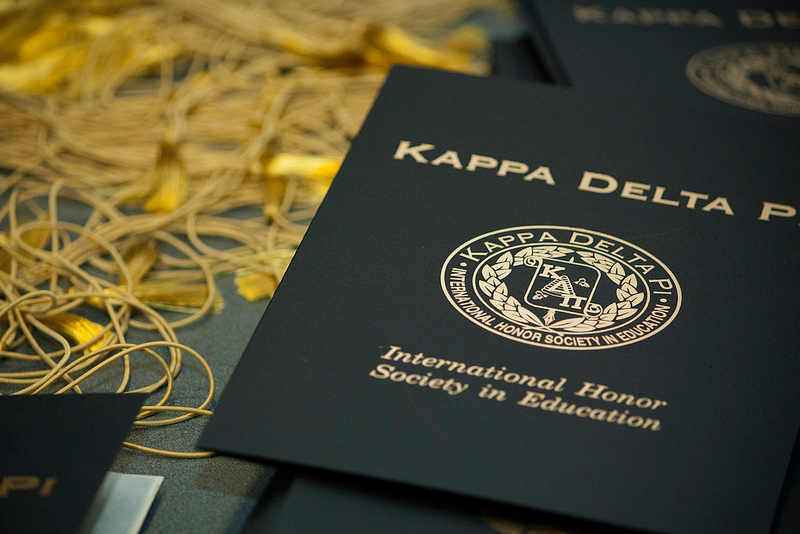 OWINGS MILLS, MD — On October 4th, Samantha Conklin, majoring in Early Childhood Education, was inducted along with 30 other students into Kappa Delta Pi, the International Honor’s Society in Education. As members of the Psi Omicron chapter of Kappa Delta Pi, these students have not only shown good academic standing within their junior year of college, but they have also dedicated time and effort to give back to the community through various education initiatives. “I am continually amazed at the dedication and commitment that these students show,” said Jill Suffel, Co-Counselor of Kappa Delta Pi and Adjunct Faculty Member at Stevenson University. In addition to these academic requirements, members must also participate in education programs both on and off campus. Such programs include tutoring, assisting in daycare, and facilitating initiatives for local libraries. Stevenson University is a coeducational, independent institution widely known for its unique synthesis of traditional liberal arts education and exceptional career preparation. The 4,200 students receive an innovative education from the six academic schools- Business and Leadership, Design, Education, Humanities and Social Sciences, Sciences, and Graduate and Professional Studies. Each student experiences individual attention from faculty members and extensive career preparation gained through real-world training. Two ideal locations just north of Baltimore, Maryland, in Stevenson and Owings Mills, make the University truly unique. ANNVILLE, PA — Aileen Koch of Franklin, was selected to serve as a resident assistant at Lebanon Valley College. LVC selects 48 resident assistants (RAs) from the student body who live in the residence halls and serve as mentors and role models. RAs do a mixture of social and educational programming, helping first-year students make the transition from high school to college and making sure students of all ages have access to the College’s many social and academic resources. LVC offers a range of housing options. For the first two years, students live in traditional residence halls, allowing them to learn about themselves, meet a lot of people, and make friends. Most upperclassmen live in more independent environments, including small houses, rooms clustered as suites, or apartment-style housing. Living on campus is described in this LVC YouTube video. Lebanon Valley College(R) in Annville, Pa., welcomes 1,648 full-time undergraduates studying more than 30 challenging and sophisticated majors, as well as customized self-designed majors. Founded in 1866, LVC has graduate programs in physical therapy, business, music education, and science education. The College offers automatic scholarships worth up to half tuition for students graduating in the top 30 percent of their class. On the web at www.lvc.edu. PHILADELPHIA, PA — Matthew Fitzpatrick has been named to the summer 2013 dean’s list at University of the Sciences. Selection for this award is based on completing and passing all assigned courses with no grade below a “C” and attaining an academic average of at least 3.4 for courses taken in the summer semester of 2013. Fitzpatrick of Sparta, NJ, is a doctor of pharmacy student. At University of the Sciences, students embark on a challenging learning experience in a proving ground for successful professionals in the science and healthcare-related fields. A private institution dedicated to education, research, and service, and distinguished as the nation’s first college of pharmacy, the University has produced leaders in the science and healthcare marketplaces since its founding in 1821. Students in USciences’ five colleges learn to excel in scientific analysis and to apply their skills to improving healthcare in the lives of people worldwide through such disciplines as pharmacy, biology, chemistry, psychology, physics, physical therapy, healthcare business, and health policy. For more information, visit usciences.edu.